Share a single HDMI display between two sources - auto detects priority source signal or signal loss. The VS122HDMIU High Speed HDMI Auto Switcher lets you share a display between 2 consumer electronic devices or computers and prioritize your HDMI signals. The HDMI switch features a primary and secondary HDMI input port, and automatically defaults to the signal from the primary input port. If the signal connected to the primary input port is lost, the device automatically switches to display the signal from the secondary HDMI input port. Designed for maximum control and versatility, the high-speed HDMI auto switch box also offers manual control of connected signals with easy-to-use front panel buttons that allow you to toggle between video sources. The VS122HDMIU High Speed HDMI Auto Switcher lets you share a display between 2 consumer electronic devices or computers and prioritize your HDMI signals. The HDMI switch features a primary and secondary HDMI input port, and automatically defaults to the signal from the primary input port. If the signal connected to the primary input port is lost, the device automatically switches to display the signal from the secondary HDMI input port. Designed for maximum control and versatility, the high-speed HDMI auto switch box also offers manual control of connected signals with easy-to-use front panel buttons that allow you to toggle between video sources. 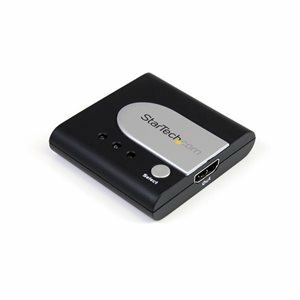 The VS122HDMIU High Speed HDMI Auto Switcher is backed by a StarTech.com 2-year warranty and free lifetime technical support.